If you’ve ever tried to write in a language that isn’t your own, you are probably well aware of at least two things: first, writing requires much more time than usual and, second, even online translation services are often wrong. Italian researcher Antonio Rotolo faced these issues early in his academic endeavors. To pursue an international career, he was required to publish his papers in English. After six months at MIT, he came up with the idea of a new kind of online translator — one that could not be wrong (unless The New York Times, BBC or other generally reliable sources made a grammatical error). Online since February 2016, Ludwig is a linguistic search engine designed to help people write correct English sentences. The company, headquartered in Catania, Italy, was started by a group of researchers and engineers from Sicily who have worked in a number of universities in the U.S., Norway, Germany and Spain. In July 2014, Ludwig received a €25,000 ($27,880) grant from Telecom Italia, a $15.29 billion telecommunications company. In at least one case, Ludwig might lead users to reach an impasse. Let’s say, for example, that I need to check if “data” is singular or plural. Ludwig shows examples for both forms, “data are” and “data is.” In this case, engineers Francesco Aronica and Salvatore Monello explained, users can verify which form has more results, but also do additional research on the web. The team of Ludwig is composed of eight people. 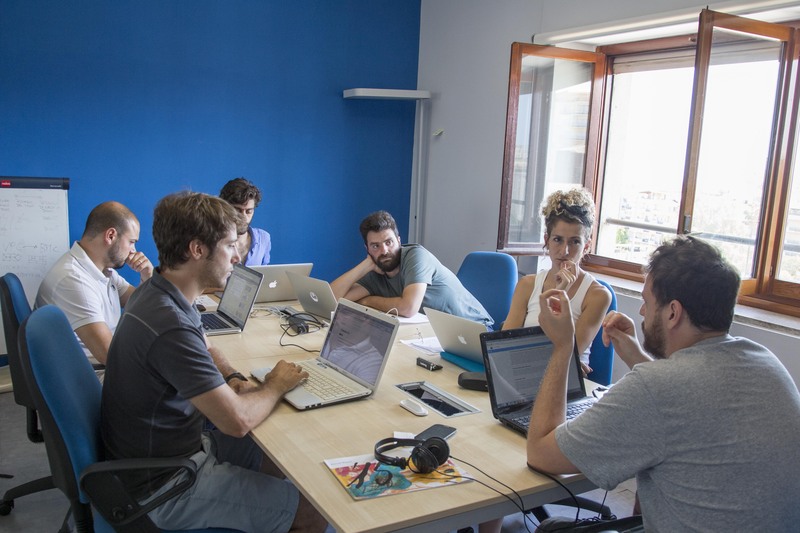 From left to right: Francesco Aronica (database expert), Salvatore Monello (algorithm expert), Francesco Giacalone (designer and developer), Antonio Rotolo (CEO and co-founder), Roberta Pellegrino (design manager and co-founder) and Federico Papa (legal expert and co-founder). Not pictured: Daniele Tagliavia (communication manager) and Antonino Randazzo (head software developer). Photo credits: Ludwig. According to the company, Ludwig has an average of 10,000 page views a day and 75,000 users on a daily basis from 168 countries. International students are some of Ludwig’s target users. Nearly 1 million foreign students studied at U.S. colleges and universities in 2014/2015, according to the Institute for International Education, and a large part of them (44 percent) enrolled in a STEM program, creating a pipeline of talent for jobs related to science, technology, engineering or mathematics. The online version of Ludwig is now free to use, but the company is working on four ways to generate revenue. Adding ads to the online version is the first. The second revenue stream is an API version of Ludwig that could be integrated in the online platforms of language schools. Also, the company will launch an ads-free desktop app in the fall. Lastly, the company would like to sign partnerships with reliable sources by offering them the opportunity to drive traffic to their online archives. Full disclosure: This article was written using Ludwig to check several sentences and, sometimes, prepositions. The author of this post is a non-native speaker of English.